On January 1st, India began a pilot program that could revolutionize the way it provides aid to its considerable impoverished population, one that could stretch every rupee spent further. Along the way, it would provide an incentive for India to scale its identification program and significantly increase access to banking for the poor. If the program can get over the logistical hurdles inherent in scaling a government program in a country with 1.2 billion people it will be a game-changer. 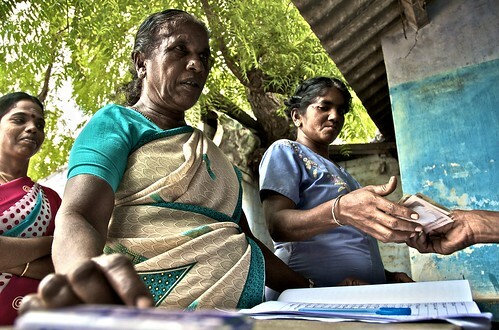 Known as the Direct Benefit Transfer (DBT) program, its aim is to move away from subsidizing “living goods” through government-run shops – a system that has long been disparaged for being ineffective and fuel for corruption – to simply providing assistance in the form of cash via direct transfer to the poor. Initially, the program plans to enroll about 245,000 poor Indians, with plans to scale significantly if it is successful. This would completely upend the current state, which is good news for India’s budget and bad news for the 50,000 government shops through which $1.4 billion (1% of India’s GDP, roughly) in subsidized goods are currently funneled; it is believed that, due to corruption throughout the supply chain, only about 41% of grain meant for the poor actually gets to them. Moving away from this system will stretch a rupee further, allowing more money to go directly into the pockets of the poor. Other state-run cash transfer programs – like Mexico’s Opportunidades – have been shown to improve health, and the concept is being used by a number of countries. There are significant ancillary benefits, too; the new system’s success is predicated on the ability to identify the poor, which India is attempting through biometric scans paired with an identification number. Such a system would allow for more accurate headcounts of cities and states, and could have a significant impact on the accuracy and efficacy of voting transparency, vaccination campaigns, and more. It’s an audacious, never-before-tried project, and the DBT program would add urgency to its rollout and success. It would also force the Indian government to figure out a way to increase access to banking for the poor; after all, they need to have bank accounts to receive DBT funds. This would provide millions of Indians the opportunity to put their savings in a bank, which is a step towards increasing financial inclusivity; more savings in banks also means a larger supply of credit to lend, which would likely benefit the poor and middle class. So, the benefits are clear: aid money is used more effectively, the Indian government is able to better identify its population, and access to banking increases significantly. Unfortunately, these are significant benefits precisely because they are such large issues to begin with; signing up the population for biometric identification requires a Herculean effort, and in three years only 220 million Indians have been given a twelve-digit number. The poor in slums and rural villages are likely to be the most difficult to identify, adding another layer of complexity to the task. Even with the identification issue solved, the poorest Indians still need to have a bank account. That is a gargantuan logistical challenge in itself, when only about one-third of the population has one – and in the poorest quintile that number falls to about one-fifth. One route would be to leverage the existing telecommunications network, which is what the Kenyan government has allowed Sarfaricom to do with M-PESA, the mobile banking platform widely used there. Unfortunately, only about 564 million Indians have a mobile phone, and as this World Bank Policy Research Working Paper shows, Indian bank regulations are holding back innovations in mobile banking. Put it all together, and it’s no surprise that only 4% of Indian adults used a mobile phone for banking. India will likely need to reduce these regulations, incentivize banks to offer a mobile banking platform, or opt to significantly expand currently-existing brick-and-mortar banks if for the DBT program to have a shot at succeeding. All told, the current evidence indicates that the DBT program will be a game-changer – just not anytime soon, and only after the main concerns are dealt with. The logistical issues involved will ensure that the roll-out is slow and arduous, and the identification system will likely take years to complete and be sustainable. Once ready, though, India’s DBT program has the potential to significantly alter the way India’s poor receives assistance from the government, and could serve as the model for future reforms the world over.